by Talen on October 7, 2008 in Thailand Attractions 6 Comments - Leave a comment! About 20 minutes outside of Pattaya stands the largest Buddha image in the world, Khao Chee Chan also known as Buddha Mountain. Built in 1996 to commemorate King Bhumibol’s golden jubilee, the 50th anniversary of his accession to the throne, the King’s children with members of the department of Geological Resources and the nearby Asian Institute of Technology started the construction. Using American laser technology the image was carved into the sheer cliff in just two days, but It would take many months to fill the grooved image with the required gold leaf. The cost of the project is said to be over three million dollars. The mountain itself is a remnant of Thailand’s once wartime mining efforts. 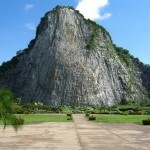 During the Vietnam war the Thai navy mined the mountain for stone to use at the nearby American base. After the war mining continued to provide stone for local roads and construction. In 1976 His Majesty King Bhumibol halted mining in the area. Although mining was stopped illegal mining at the site still took place for many years as locals mined stone to sell to local contractors. The outline of the sitting Buddha, also known as Sukhothai-era Buddha, stands 130 meters tall and 71 meters wide. The image can literally be seen from miles away. Below the sheer cliff are beautiful gardens with terraced pools filled with lotus flowers as well as several shrines to pay homage. The mountain is a good place to stop on your way to or coming from Nong Nooch Gardens as it is only 7 kilometers away. It makes for a great day trip. The gardens look like a very serene place. Why is that mountain considered a “buddah image?” It doesn’t look like the li’l fat dude. Carols last blog post..Sticky Post! Ok, that made me laugh…The lil fat dude as you put it is the Chinese depiction of Buddha. The Thai version is more in line with the Indian image of Buddaha. I loved your article on Buddha Mountain. I always enjoy learning about new cultures and traditions. It is a true sight to see, the visiting area is one of the best kept places i have ever seen. I am located just up the road from there. There is a lot to see in this area and some nice beaches. Please take a look at our site for more information.